This entry was posted in 修正・変更情報 on 2013年6月17日 by salonfactory. This entry was posted in リリース情報, 修正・変更情報 on 2011年7月7日 by salonfactory. This entry was posted in 修正・変更情報 and tagged 顧客管理　フリーソフト　サロンファクトリー on 2009年7月1日 by salonfactory. This entry was posted in 修正・変更情報 on 2009年2月13日 by salonfactory. This entry was posted in 修正・変更情報 on 2009年2月6日 by salonfactory. This entry was posted in 修正・変更情報 on 2009年1月8日 by salonfactory. This entry was posted in 修正・変更情報 on 2008年12月22日 by salonfactory. This entry was posted in 修正・変更情報 on 2008年12月15日 by salonfactory. This entry was posted in 修正・変更情報 on 2008年12月9日 by salonfactory. 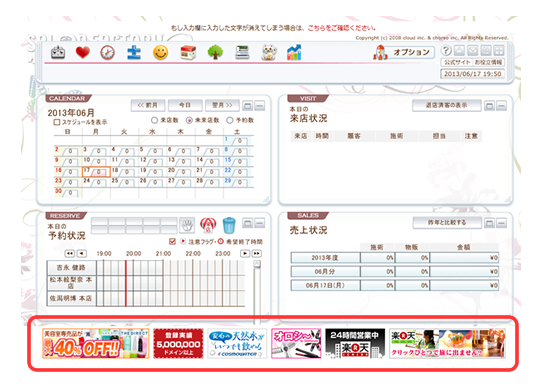 This entry was posted in 修正・変更情報 on 2008年11月28日 by salonfactory.